Ulta Beauty, long one of the few superstars in the retail world, turned in another set of red-hot results. Key to its success this quarter? Exclusive physical distribution of digitally native brands, including Kylie Cosmetics by Kylie Jenner and Morphe. “Both brands drove very strong traffic in stores, suggesting our guests are motivated to make more trips to the store to try these products in person,” says Mary Dillon, CEO, in a conference call reported by Seeking Alpha. 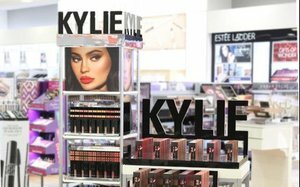 Earlier this month, Forbes named reality star Jenner, who is 21, its youngest-ever self-made billionaire, and reports she sold $54.5 million worth of products at Ulta in just six weeks. Ulta, based in Bolingbrook, Ill., says net sales grew by 9.7% in the fiscal fourth quarter, reaching $2.12 billion, up from $1.94 billion in the same period a year ago. Comparable-store sales gained 9.4%, overall, including a 7% gain in retail sales, a 6.2% jump in salon services, and a 25.1% improvement in ecommerce. Net income rose 3.1% to $214.7 million, compared to $208.2 million in the year-ago period. Fourth-quarter marketing helped, with holiday campaigns boosting both aided and unaided awareness for the brand, especially among Gen Z, Gen X, African-American and Latina segments. The retailer says it intends to open 80 new stores this year, remodel or relocate another 20, and refresh about 270. And it expects to notch comparable-store sales growth of between 6% and 7%, with e-commerce rising between 20% to 30%.